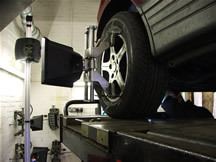 Wheel alignment is the alignment of wheels to the manufacturers set specifications and is designed to give you the most comfortable ride as well as improve the life and wear of your vehicle's tyres. Irregular alignment can cause uneven wear of your tyres and compromise the safety of your vehicle.. Servicing the Leatherhead, Oxshot, Bookham, Dorking, Leatherhead, Fetcham, Mickleham, Effingham, Ashtead, Cobham, Esher and Hersham areas.